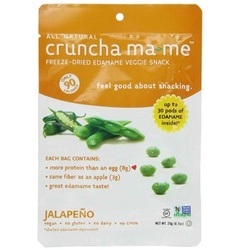 The cruncha ma-me team has developed the perfect snack - one that fills you up, is packed with nutrition, and is made only with 100% all-natural, whole, gluten-free ingredients. We use the highest quality premium non-GMO edamame and veggies to provide an ideal balance of complete plant-based protein, fiber, complex carbohydrates, mono-unsaturated fats, and powerful anti-oxidants. We freeze-dry the ingredients, preserving all the essential nutrients. The result is a minimally processed food that is a much better alternative to other snacks that are either roasted, baked or air-popped (high temperatures destroy nutrients). We use all-natural seasonings to make our Sea Salt & Black Pepper, Lightly Seasoned, Jalapeno, Onion & Chive, and Veggie Medley flavors scrumptious. For edamame purists, our Naked flavor provides the untouched taste of edamame with absolutely nothing else added. Finally, a snack that makes you feel good about snacking!